Here is a list of the most influentual Scrumpy & Western artists past and present. We have also added a new cateogy of Scrumpy & Western Comedians, whose material fits with the West Country humour of Scrumpy & Western music. The list is not complete, so if you think we are missing anyone, please let us know. Acts marked with a tick have a live link to their website's gig page (updated 2018) - see our gig guide. NB: Other bands/acts may well be active and found via social media! Adge Cutler & The Wurzels - The founding father of Scrumpy & Western music, Adge Cutler's influence in the genre can not be underestimated; his songs remains a vital and integral part of the West County forty years on. Still active as The Wurzels. Acker Bilk - Somerset-born and bred, the inclusion of Mister Acker Bilk's jazz might stretch the definition of the boundaries of Scrumpy & Western music, but his importance in the history of the genre is undeniable. Len 'Uke' Thomas - legendary Bristol entertainer who was a true pioneer of Scrumpy & Western music and early influence on Adge Cutler, writing and singing many of his own songs written in the Bristol dialect. Trevor Crozier - late singer, songwriter and talented musician who wrote and recorded several classic Scrumpy & Western songs, including Don't Tell I, Tell 'Ee, The Piddletrenthide Jugband and Dead Dog Scrumpy. Shag Connors & The Carrot Crunchers - a humorous and fondly remembered West Country band, based in Gloucestershire and led by the inimitable and sadly missed Shag Connors and his beer-drinking cockerel. The band is still active as Mart Connors & The Carrot Crunchers with Shag's son Mart as frontman. The Crofters - a folk duo consisting of Gef Lucena and Martin Pyman who released three Scrumpy & Western EPs in the 1960s. Pigsty Hill Light Orchestra - a Bristol-based band renowned for their eccentric style and eclectic choice of material. The Yetties - Dorset's answer to The Wurzels. The Yokels - Wiltshire's very own Scrumpy & Western stars. A.D. Rice & The Wazzuks - an Adge Cutler tribute band from the Bristol area. The Mangledwurzels - A three-piece Scrumpy & Western band from East Somerset who play Wurzels songs, old and new, blended with self-penned titles and pop standards 'Mangled' in true Wurzels tradition. The Cowshed Cleaners - a band in the Scrumpy & Western tradition from Tiverton in Devon, who claim to be "the only West Country group that smells like one"! The Cornish Wurzells - A Wurzels tribute band from Penzance. The Cutlers of Cornwall - 'Scrumpy and Western perfection' from Cornwall. The Twerzels - a two-man Wurzels tribute band. Combyne Arvester - a four-piece Scrumpy & Western from Somerset. The Plonkers Agricultural Orchestra - plaguing the New Forest with their 'Ampshur brand of Scrumpy & Western moosic since 1979. The New Forest Yokels (Plonkers) - a "yokel’s agricultural orchestra" in the Scrumpy & Western tradition from the New Forest. Surfin' Turnips - scrumpy-fuelled cider punk band playing Scrumpy & Western Pirate-core. The Tinker Boys - 'Scrumpy 'n' Western with a girt dash of Irish'. The Somerset Paddies - music from Somerset and Ireland. More Silage - a four-piece Scrumpy & Western folk/pop band from East Harptree. The Swinging Udders - A Scrumpy & Western band from Bath. The Scrumpy Bashers - An English folk/Scrumpy & Western band from Midsomer Norton. Countryside Alliance Crew - a dance crew blending current dance, hiphop and jungle music with rural Scrumpy & Western lyrics. It's very different from Adge Cutler, but deserves its place on this website! Derek Wright (aka DJ Dub) - "Jethro meets The Wurzels in Cornwall"
Panda & Kenwyn - A Scrumpy & Western duo from Cornwall. 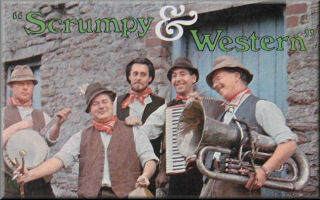 The Somerset Barnstormers - Somerset-based Wurzels tribute band. Bill Bailey - Somerset-born comedian, actor, musician, and self-confessed Wurzels worshipper. Greg Suggitt - stand-up comedian from Wiltshire. Jethro - Self-styled Cornwall's Minister of Culture with his particular eccentric brand of humour. Judro - is true Cornish tribute to Cornish comedian Jethro. Jeddro - is a tribute impression to Cornish comedian Jethro. If you know of any bands or comedians (or indeed anyone else) missing from this list - please let us know!